All you need to play Ultimate Frisbee or ‘Ultimate’ as it can be known is a frisbee and some cones/markers if you don’t have a marked out playing space. To play Ultimate Frisbee, split the young people into two even teams, you will need a minimum of two players on each team. It is usually best to play with between 5 and 7 players on each team. Decide which team will start by a coin toss or similar, then the opposing team should all start in their end zone with one player throwing the disc high into the field of play towards the other team, for a member of the opposing team to catch. Once they have thrown, they should go out onto the field of play to start defending. 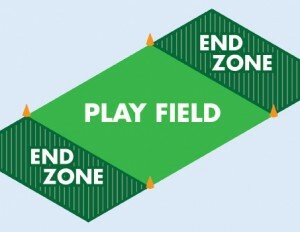 Play is advanced by moving up the field of play, completing passes between team members, to reach the other teams end zone. A goal/point is scored when a player successfully catches the disc in the opposing teams end zone. On scoring the teams switch ends and the team that scored will throw the disc out to the other team, in a similar way to how the game started. Players must not move when holding a disc, and must not hold on to the disc for more than 10 seconds. It is the defenders job to count the 10 seconds and manage the time. When releasing the disc, it is permitted to take one step in any direction. The disc can be thrown to players in any direction. A player receiving the disc must stop immediately, although it is acceptable that a few steps to allow the player to stop their forward momentum. If a disc is dropped, goes out of bounds, or is intercepted (slammed down to the ground), play is turned over to the opposing team from the same spot. The team not in possession of the disc should be trying to intercept the disc and disrupt passes being made by their opponents – they must not come into physical contact though and only one player can defend within 1 metre of the player with the disc. The game is usually played up to 15 goals, but you can reduce that to 10 or 5 if you have less time. Ultimate Frisbee is a self-governing game and there is no referee. Players should call their own fouls etc in the true spirit of the game - but you may appoint an impartial observer to help keep track of time etc.